Angela Yosten: Me... a professional photographer? NO WAY! I have never had anyone mistake MY photos for being professional. 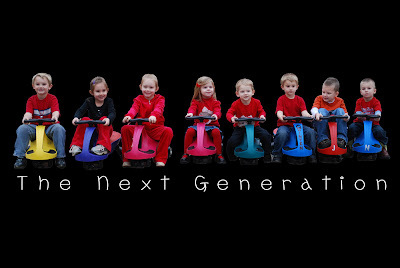 Well, Remember the picture of all the kids on their scooters? My mom wanted to use this picture for her New Years letter to send pictures to all the family. So, I did a bit of editing and removed the original background from the photo using Adobe Photoshop and dropped in a black background. Then we thought it would be cute to add the words... The Next Generation. I have to admit, I was very pleased with the way the turned out. So I uploaded them to Walmart.com to have them printed through their 1-Hour Photo at the Walmart closest to my mom so she could just go and pick them up. Never, in a million years, would I have thought that they would mistake my photo as being professionally done. Well, they did and they would not let my mom take the pictures. They told her that I had to come up and sign a copyright form stating that I took this picture and at that I am allowing her to print multiple pictures of this photo. HA! We got a huge kick out of this... It even made me a bit giddy! I was meeting her for lunch anyway, so I just stopped off at the walmart and signed their release form. Tee hee hee! I officially have a copyrighted photo... love it! I would totally mistake it for a professional picture. That one turned out awesome. It has the feel of "whats her name" that does the babies in flowers, etc. Love it! I love how it turned out. I loved it in the beginning and this just kicks it up a notch. You should submit it to the make of the riders, looks like great advertising to me! I've had that happen to me also. My daughter got married last year, so last Christmas I took their engagement photos. I had just purchased Adobe Photoshop and did some fun composite and other manipulated photos. She took them into Walgreens and they wouldn't print them. Since I live 12 hours away, they called me and I had to give varification that I took the photos over the phone. P.S. We opened our shop on Jan. 1 and just finished our first week! Hopefully, all our weeks will be as successful as our first! I think it looks really professional...how cool is that to get such a great shot of the cousins! But the same thing happened to me with a photo my friend did of my daughter...only Costco made her FAX a release...they wouldn't take it over the phone! Well of course you are a professional with wonderful subjects to photograph! Fantastic! I'm sure that photo and the accompanying story will become a family heirloom. ha ha... how exciting! I guess when you are good, you're GOOD, huh? What a great happy inconvenience! Love this! Love the pic too and what you did to it. I can see why Walmart believed it to be a professional photo. And I think Pam has a great idea! Congratulations! As a librarian, though, I have to share even better news -- that every time we create a work, it is automatically copyrighted, even without the c-in-a-circle sign. Sure, you can register it if you're afraid someone will steal it, but the great part of being American is that it's an automatic gift. So while Wal-Mart asked you to put it in writing, you had copyright privileges already!